Alright! We are off to a good start in 2014 with two very solid and distinct looking steeds. After the Snow-Beast Steed got my vote for "Most Unique" last month, February does not disappoint with a very beautiful steed of the month called the Westfold Steed! 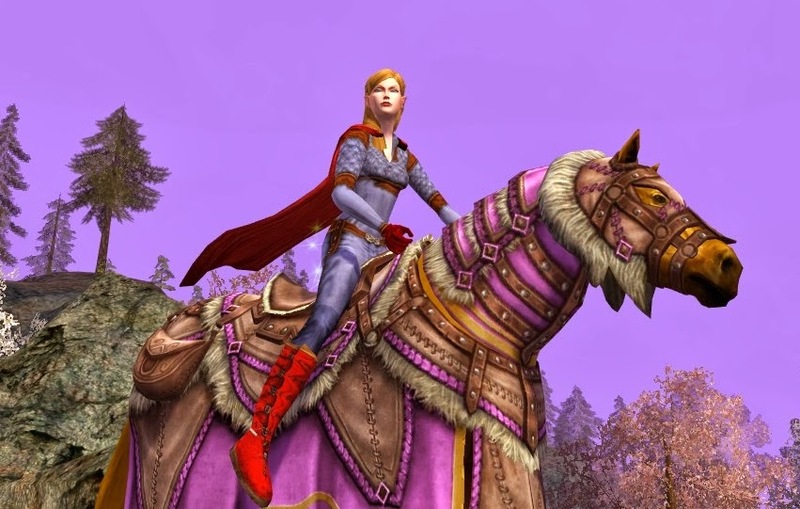 The steed comes with 5 matching warsteed pieces: leggings, saddle, halter, caparison, and the accessory (saddle bags), so you can customize the way you like. 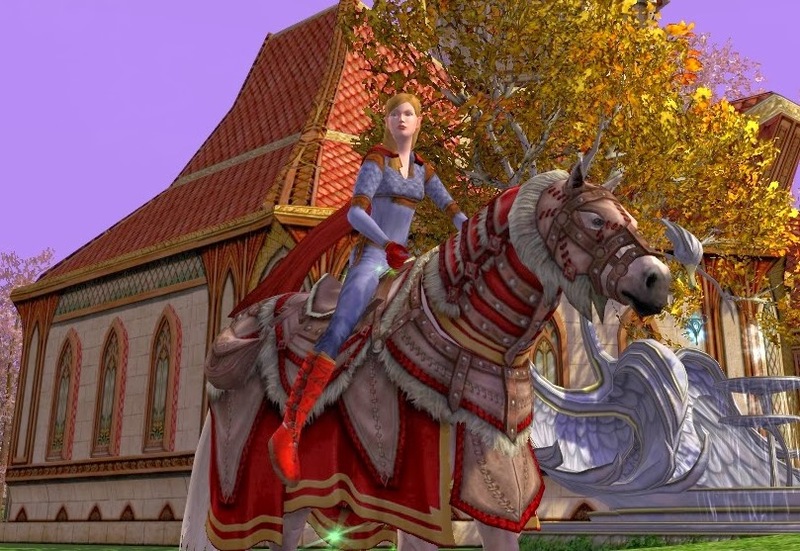 The Westfold Steed has many elements that might make it your favorite. (1) The warsteed dyes really well! 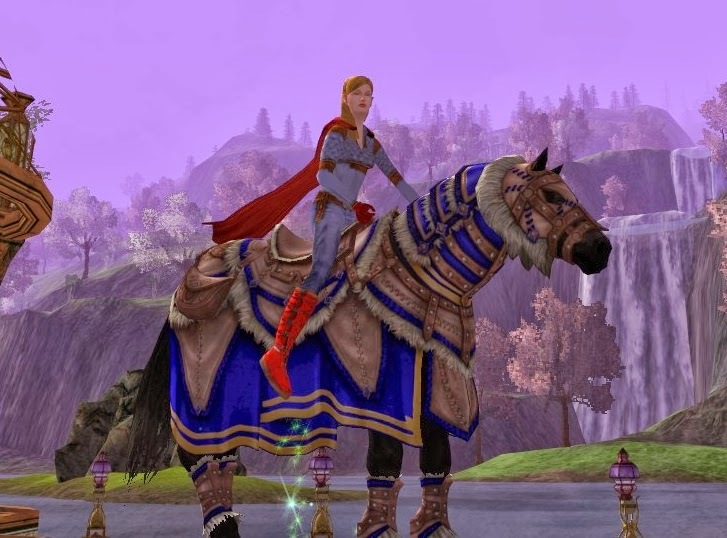 Every color I tested looked great on this steed; I show you a few here but whatever your favorite color, you will probably be pleased with how the outfit holds the color. As always, if you have a special request, just ask and I will try to assist with pictures. (2) The warsteed is distinct looking. 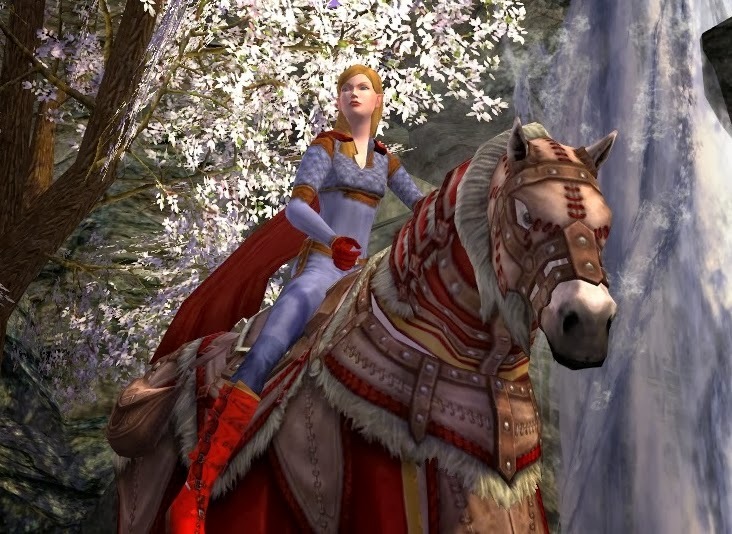 Some of the cloth warsteed outfits tend to run together, but this one stands out with its fur-lined halter and caparison. Everything is just right and not overdone. With the right color and rider outfit, you could butch it up, or make it really feminine (see below). Here is the basic Westfold Steed. He has a typical base speed of +68%, same as other steeds. 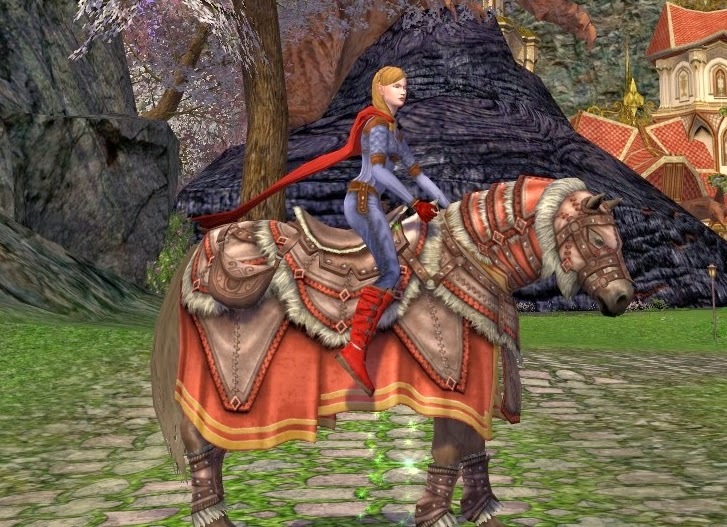 The outfit is a melon color, not in the normal dye palette, which matches well with the horse's pinkish brown hide. The outfit is subtly fur-lined. 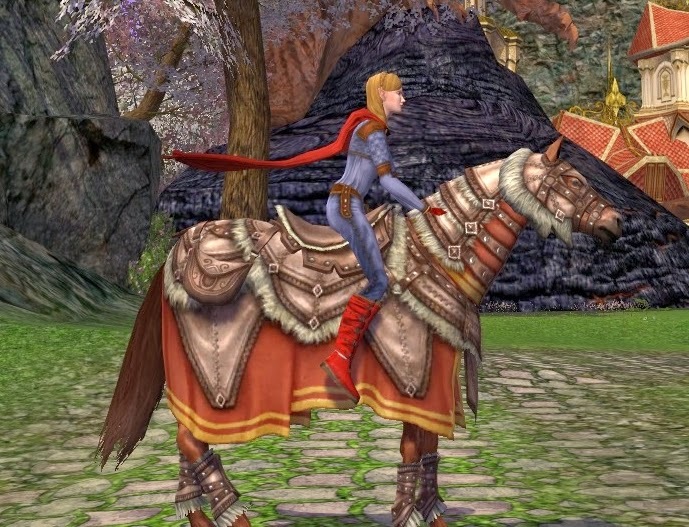 The default colors and outfit for the warsteed appear to me to be exactly as expected. The warsteed grey hide gives the melon color a more subdued look (which is reaccentuated by different color hides, as expected). All of the color dyes look great; here are a few after the default colors. Ride Well Free People of Middle Earth! Always thanks for visiting and I hope to see you again soon! 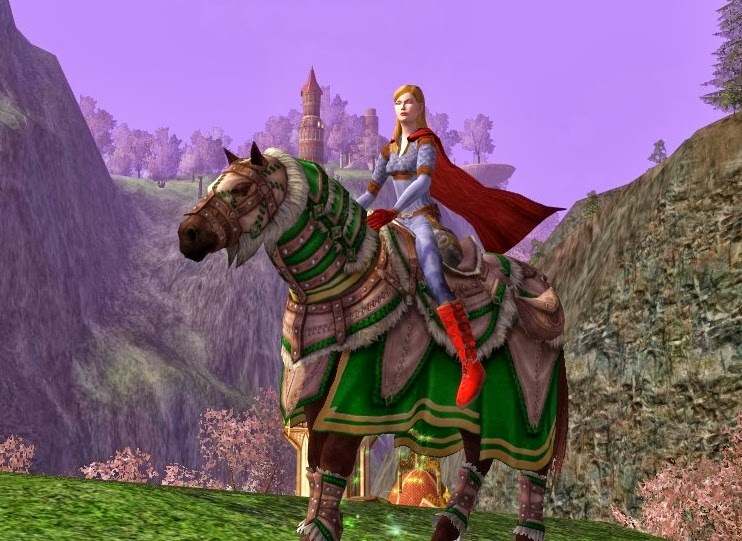 Where can you get this steed in-game? Hi. I've registered but never used Blogger. How do you get your own url, danania.net? Great question Frank Garner. I own the www.danania.net URL by registering it. I am by no means computer savvy, so I asked my friend and fellow gamer girl Szarwyn how one gets a site. You can register and get a site name through companies that manage such things; I got mine through namecheap.com for some nominal fee per year (seems like it was about 12$/yr). Linking the site name to Blogger is also fairly easy. There is a place in the maintenance section that asks the very leading question, like "name of site to point to your blog?". Easy enough once you own the name.